At the moment there is one common area of focus among the global population who idolize the bodies of the magazine cover models. It seems that everyone is looking for that amazing formula, that incredible diet, that perfect routine, that precise way of shedding a huge percentage of body fat so that the summer beaches can be jam packed with male egos, and woman vying for the next glimpse of some hunk whose eyes cannot diverge from her direction. What amazes me even more, is the lengths that most people will go to get there, and I mean great lengths accompanied by huge sacrifice. When the statisticians say that the wellness industry will be in excess of a trillion dollars over the next few years, it’s obvious why. Money has no meaning when it comes to looks and health and most people are sucked into an ever results promising routine of taking the “miracle food” which will help them achieve their results with no pain, no effort and incredibly in a short space of time. Well I am sorry to burst your bubble, but your coffee went ice cold a long time ago. What has become of the human population, we go to great lengths to achieve a physical appearance that might be short lived without really even taking into account what’s happening on the inside of our bodies. Over and above that, it is really obvious that we are all being taken advantage of through clever consumer marketing and most people do not have the knowledge to analyze or research if the products they are taking are truly beneficial for their overall health . Usually the person selling the stuff is an amazing physical specimen of the human race who leaves us in awe and we hang on to their every words, to be able to look like that. The magazine photographs and bottle labels of super physiques are also more than enough to penetrate our minds and impact our purchasing decisions. I have been so inundated with requests on how a person can target a specific fat zone on the body, or been told that such a supplement will burn off this type of fat in this particular area, and when I think about it, I just think we have all gone mad. Are we that desperate as to believe that when a substance is taken it will be absorbed by the body and then intelligently utilize its built in GPS to direct itself to a specifically chosen area where it will attack the fat and shape the area accordingly. I have even been asked to recommend natural appetite suppressants and I think to myself what a contradiction in terms, what is so natural about suppressing one appetite. A feeling of hunger is there for a reason suppressing it is totally unnatural. A couple of weeks ago a young lady asked me, what I thought of an entire range of supplements that she was taking. My first question to her was about her eating habits. This threw her off totally, and she asked again about the supplements. I was cruel about it this time, as I tend to use a form of shock treatment to wake people up, and I got straight to the point. I told her that if she is not eating properly at all then her body does not deserve supplements. I was being brutally honest and I was trying to get to the point that a supplement is just that, it’s a “supplement”. Its purpose is to supplement a healthy diet. I hear people telling me often that they can eat the junk because the multivitamins give them what they are not taking in, if they only knew how untrue that was. I have also come across many people who embark on a supplemental range where they could be taking in as many as 5 to 10 different products at once for a whole variety of reasons, without even considering how they impact each other. Unfortunately this is what the wellness industry has progressed to, reliance on meal replacements, quick fixes and miracle substances and we have all fallen victim to amazing advertising and spending a ton of money on hope. It seems people are becoming so dependent on popping pills, capsules and eating shakes that good nutritious food and even moderate exercise has actually become a thing of the past. Come on people, let’s get realistic and start to think for ourselves. There is no amazing formula to change our bodies overnight. So the beaches await, the time is here to get into shape and the health stores are licking their lips because your money is floating in their direction. But there is no quick fix for getting there, and the point I am trying to make is that getting into shape and staying healthy, is a lifetime commitment, not a three month attempt at shredding the fat and boosting the muscle mass. Now don’t get me wrong I am not saying that supplements don’t work, what I am saying is that a supplement should not be taken instead of proper nutrition and exercise. A lot of us out there have such stressful lifestyles that we forget about ourselves and then at some point of desperation try to find the shortest path to fix the problem. With all this in mind, I can only make a few suggestions which I hope will put you on an even footing and empower you to make some logical decisions. Firstly know that there are no short cuts to a healthy lifestyle and a well-shaped healthy body. Fitness cover models work extremely hard to keep in shape and it’s a way of life to consciously look after yourself and make the healthy choices. There are many choices to make when reaching for a certain goal and I have created a pyramid chart to stress the four main areas I would like you to have a look at. Each area plays a vital role in leading a healthy life, and each area has more importance then the next however they all impact on each other in one way or another. 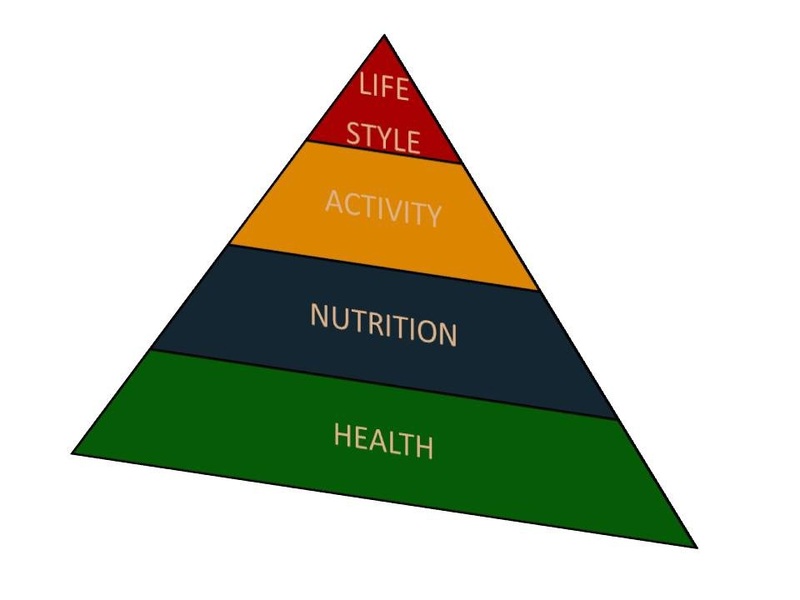 To put this in perspective let’s take a look at each of the four areas of the pyramid below I have drawn. The first question you should be asking yourselves is, what the current condition of your health is. Let me be totally clear about this, it is not a matter of how you are feeling or how good you think your level of health is. This needs to be a proper snap-shot of your health, and this can only be achieved through a thorough medical examination. Many people are afraid of medicals, but they are lifesavers and I cannot stress enough the importance of doing an annual medical. When embarking on any major change such as incorporating a new exercise regime, you definitely want to know that you are starting it with your health intact, because any stress on an unhealthy body can lead to major problems. Nutrition to me is king. What we ingest will directly impact our health either for the good or bad. Remember you are what you eat. Eating healthily is not only for your external appearance, but more importantly for what is happening on the inside. The only way to truly embark on a healthy eating plan for life is to be taught to make the healthy eating choices, and I would highly recommend a nutritionist to guide you in the proper direction. For those of you who are set in your ways and think you are always eating healthily, I can promise you there is always room for improvement. Proper nutrition is also the only way you will break down body fat and get into proper shape. Remember to first solidify your eating habits then only take a look at supplementing. I know many people who don’t take in any “quick fix” supplements such as fat burners and still manage to maintain a very low body fat, keep their energy levels up and actually enjoy their food and indulge a little. Exercise in any form is great for the body, there are many benefits when embarking on an exercise regime and accompanied with a healthy eating plan can provide you with the best possible means of living a long and healthy life. If you are currently exercising regularly, then make sure you are training towards a goal that you want to achieve. Too many people train without a proper goal in mind and then they lack the motivation when they don’t have a basis by which to measure their progress. Often people who exercise on and off try programs of others who are in advanced levels of training hoping it will also work for them. This is a common mistake, you need to start at the appropriate level and build up to achieve your desired goal, there are no quick wins here, and a solid foundation will set you up for life. Everyone is unique when it comes to training and I cannot emphasize enough that you speak to a professional when it comes to laying out a proper training routine for you. The fast pace hustle and bustle of our lives just does not stop. Early morning traffic, nonstop phone calls and meetings, as well as the pressures of a career or business keep our minds away from important factors such as health. There are always excuses for not eating, not training, and not resting, and in the end we actually have nothing to show for it, because it directly impacts our quality of lives and our health suffers. You need to take a back step and analyze your lifestyle. Our bodies talk to us every day, when fatigued, tired or sick we know we should be resting, hardly any of us listen and then we land up paying a higher price for it. When hungry there is no excuse not to eat, and when there is a television set and a couch then there is no excuse not to do some form of exercise. Look at your limitations and set aside some time to take care of yourself, because after all you are most important and if you don’t have your health you cannot give the best of yourself to anyone or anything. To conclude I just want to touch back on the “quick fix” syndrome and wellness industry funding, I am sure by now you realize that getting into shape, improving your health and then maintaining it takes work and effort and is not an overnight program for instant change. Seriously think about the different aspects of your life and where you need to make improvements and changes. Select a goal and a starting point, get some professional advice in whichever direction you want to go, even if it’s to the beach in a bikini, and know in your mind that even though it will take time to get there, when you do finally reach your destination you will look back and say I enjoyed the journey and it was worth it. Very true, people seem to have a quick fix attitude… Fantastic read, will be sharing this article.. Thank you Mark..